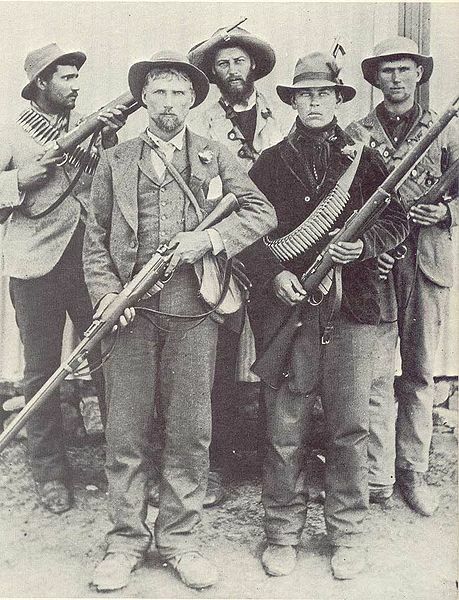 The British faced a crisis in 1900 during the Boer War. They suddenly realized they couldn't hit what they were shooting at. The Boers didn't present themselves as easy targets anyway, and they also fielded the excellent Mauser rifle which had features that outshone the Lee Enfield. The Lee Metford was the standard army rifle since 1888 and had been modified with a new barrel when the nitro-cellulose powders started eating up Metford barrels. The new 10 round double stack magazine also was standard. The resulting Lee Enfield went to war in South Africa. The Brits found their guns to be shooting to the right, and sometimes to a large degree. There were several causes but the main one was the specifications released by the government. There was not much in it as mandating accuracy for the Lee Enfield, and all a rifle really had to do was hit the broad side of a barn. A committee was formed in 1900 to straighten out these affairs, which included how other powers tested their rifles for accuracy. A quick field fix for the accuracy problem was replacing the rear backsight leaf with the V notch moved to the left. Rifles back home at the factory had a new foresight installed .02" to the left. The specification was drastically changed to ensure future rifles would hit to the point of aim, or be returned to the factory to be repaired. To much clearance in the bolt shoulders was also found and the clearances tightened up. Some pressure from the stock on the barrel was also relieved. The Boers also had a technological innovation in their Mausers that the Brits didn't have. Their magazines could be topped up quickly with 5 rounds mounted on a stripper clip, which could be inserted into guides in the bridge and slid into the magazine with the operator's thumb. The clip was then pulled out and the shooter was back in action. This also was incorporated into the Lee Enfield, which up till then had to be loaded a single round at a time. And with that, the Lee Enfield had the advantage. An accurate, fast working, bolt action rifle with 10 rounds in the mag. However, it still had the magazine cutoff, so officers could still interfere with the rate of fire by commanding it be used.